An FIR in the incident was registered by the hospital authorities. Dead puppies found in garbage bags. Photo Credit: Twitter Handle of Sanghamitra Chaudhuri (@sangha1557). Kolkata: Two women who were allegedly involved in thrashing 16 puppies to death were arrested on Tuesday. The puppies were found in garbage bags near the Gynaecology Department of NRS Hospital (Entally police station area) in Kolkata on 13 January. The brutal incident was reported after a viral video on social media showed two women thrashing puppies. The incident triggered an outrage among animal rights activists. Apparently, the video seemed to have been taken by someone in the dental college hostel which is located adjacent to the NRS Hospital. The photos of the 16 mutilated puppies were shared by Twitterati on the micro-blogging site. An animal rights activist, who is a resident of the area, visited the spot immediately after the local woman raised an alarm. 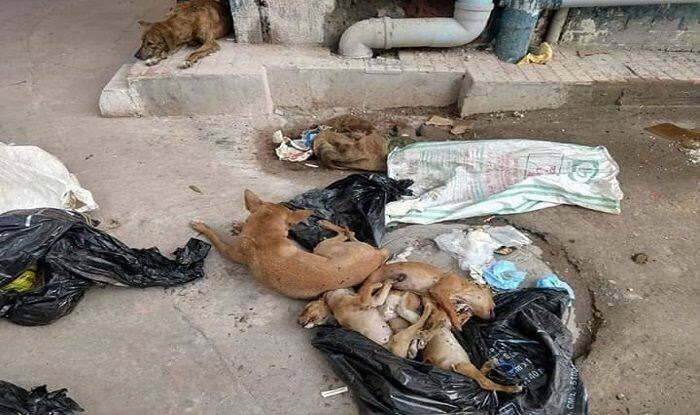 The activist soon retrieved the bodies of the 16 dead puppies from the garbage bags. The bodies were sent for postmortem at a veterinary college. An FIR in the incident was registered by the hospital authorities. During the probe, police examined footage of CCTV to identify the two women responsible for the incident. A thorough probe in the case is underway.